I have no idea why I have not seen this incredible HBO Mini Series from 2008, nor any excuse as to why I have not read the book. I can only atone for it by writing this review. What a pleasure it was to watch history portrayed so accurately, and with such fine acting. The movie, based on the Pulitzer Prize Winning book by David McCullough, is of course, beyond reproach. The research for this project was an enormous undertaking, which included the diaries of both Abigal (Laura Linney) and John Adams (Paul Giamatti), as well as their abundant letters to one another. And in that sense, this movie is the story of a marriage, as well as that of John Adams and the Revolution. 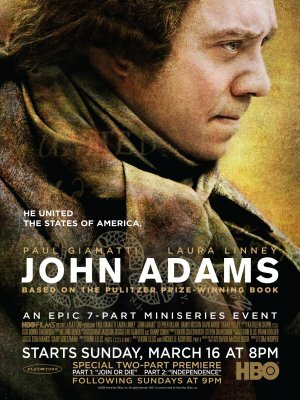 There are 7 parts to this docu-drama, though it really could be termed a documentary.From his beginnings as a lawyer, the film follows the career of one of America's Founding Fathers, as he navigates his way through war, politics and personal tragedy, and helps to form the 13 colonies into a Sovereign Nation. A large part of the series concerns the conflict between Thomas Jefferson and John Adams. They were very much divided on several points. From the subject of currency issue and National Debt, to the formation of a Standing Army, these two men could not have differed more on so many subjects, yet both passionately loved the Ideal that defined the American Revolution. Eventually, when the two men got older, they became great friends once again, and that friendship would last until both their deaths on July 4th, 1826. Adams last words were, "Jefferson survives." At the same time that he was uttering these words, Jefferson was only hours away from death himself at his home in Virginia. In Philadelphia, where the 50th anniversary of the Revolution which founded the Republic was being celebrated, the Liberty Bell was struck in commemoration, and cracked. The film is lengthy, it took me 3 nights to watch it. But I actually looked forward to the next disc each evening. A knowledge of history is helpful in watching this film, but not necessary, in order to absorb the magnanimity of the sacrifices endured by the men, and women, who helped to found our Nation. These were extraordinary people, faced with extraordinary circumstances, which they met head on.